That is the question I wish people would ask instead of – “Does my cow look too skinny?” By the time your cow is thin, it hard to get her back into condition. You need to look each day and see if your cow is getting enough to eat. 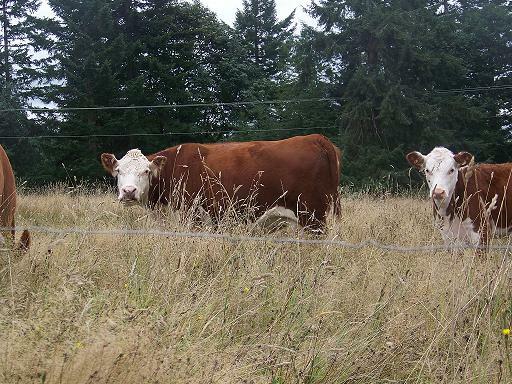 I move my cows to fresh pasture each day during the grazing season and I get a chance to look at them. Am I allotting enough grass? Are they chewing their cud when I arrive, or do they call out when they hear me coming. The first means they aren’t too hungry, the second means that I didn’t give them a large enough paddock. I look at the cows, and see if their left side is sunken in, if it is, they aren’t getting enough to eat. The place to look is below the hip bone and short ribs. Just after paddock shift – they are getting down to the business of grazing, but their sides aren’t sunken in. So I gave them enough grass the previous day. If this was spring and the grass was lush, I would be checking the same place for bloat. 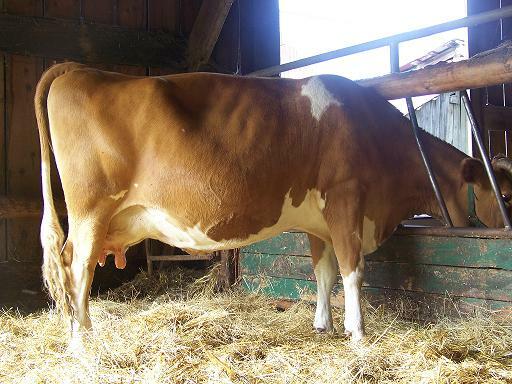 Dairy cows naturally show more bones, but you can see a slight indent on Della’s left side. She isn’t hungry, she was just standing chewing her cud. 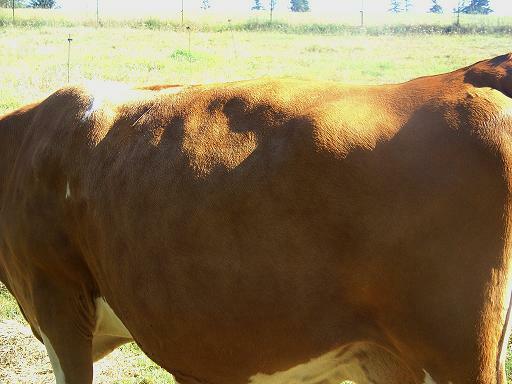 Della’s right side – cows are usually sunken in on the right side, make sure when you are assessing your cow that you are looking on the rumen (left) side. It’s easy to make the mistake of looking at a cows gut and thinking they are fat. Forget the gut, they don’t eat at McDonald’s, they get eaten at McDonald’s. Mentally cut the cow in half horizontally, and concentrate your gaze above the gut. You all remember this post showing how large the digestive tract of a cow is. 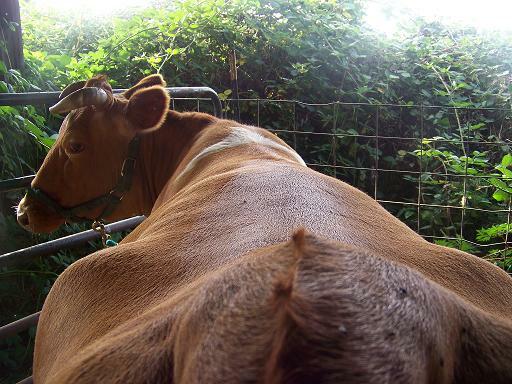 Look at the topside – the back and neck should show some fat cover on a dairy cow, and on a beef cow even more. Della looks good for going into winter, a beef cow should look fatter than this. I am still moving through my stockpiled grass. This is just after a paddock move. The calves creep feed out ahead of the cows since I leave the wire high enough to allow this. When it is time to move the cows, the calves are usually in the next paddock waiting. This shows the green undergrowth, the grass is 2 feet tall, very thick and hard to walk through. Lots of seed heads for energy and if they aren’t eaten, the seeds are trampled into the soil to add to the seed bank. Just grazed. Eaten, trampled and fertilized. 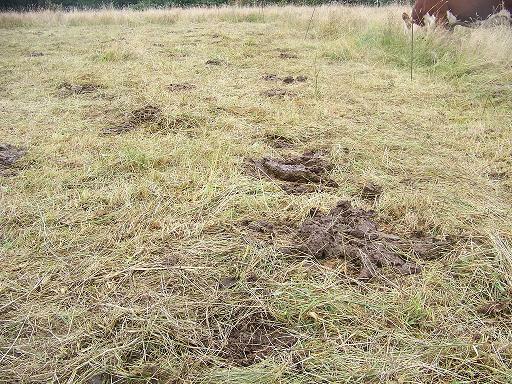 The cow birds do a great job scratching through the cow pies in search of fly larvae. A close-up of the trampled grasses. If we can get this High Density Grazing fully implemented, I can see us doing much less composting of animal manures. The cows are harvesting more of their own feed, and fertilizing it as they go. Less fuel and carbon to buy, less hay to make, and less compost to spread just because I am building a fence everyday. But change does not come overnight – but it is a worthy goal. Our neighbors have been wondering why we didn’t cut this field for hay – if we did, we would be out of grass and would have to feed the hay. So how much sense does that make? Work like dogs to harvest the hay just to haul it in the barn and then back out? How I wish my brother was alive to see this! To me, and let me point out that I know absolutely zip about cows and grazing, this system is a combination of genius and common sense. It’s good for the animals, good for the land, good for the farmer (albeit a ton of fence building), easier on the environment, and just smart. I FINALLY watched King Corn and I’m absolutely speechless on so many levels about how the majority of the beef sold in this country is raised. Poor, poor creatures. *shiver* And, hey, I’m Italian. It takes a lot to make me speechless! It was really hard to even look at the meat in the store afterward. Pasture raised, grass fed beef is what I want on my children’s plates. Other than that, I guess it’s … um, um … fish. Or giant zucchini. One more thing … gotta love Della. She’s got such a sweet face. There’s gotta be a little bit of angel in her, and a good bit of ornery, too, I imagine! Hmm … wonder where she got that. Let’s think now … who raised her?. P, opens your eyes doesn’t it? Herbivores don’t need grain, but they fatten fast and marble that way, and also produce more milk. And a lot of chronic disease comes with all that. 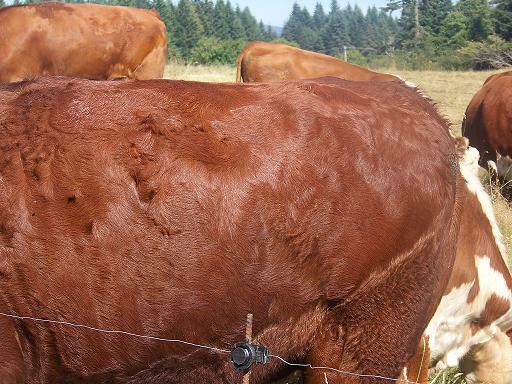 There are so many diseases right now prevalent in cattle, that it is accepted as “that’s the way it is.” So it goes. Who to blame? The consumer keeps demanding it, the farmers keep supplying it. Each person has to do what feels right to them. Some say quit eating meat, but I say quit eating industrially produced meat and step away from the industry. I can’t sell my grass fed beef to a consumer if he still buys food at the store. Implementing the HHPG will be a transition. I wasn’t brave enough to not put up any hay for winter. But, I can see if I had left those hayfields tall and not cut them, I probably could make it through the winter without feeding hay. However, it is hard to teach an old dog (me) new tricks. It takes a cow’s rumen 5 days to adjust to a different feed, and at first the hay is a supplement so it a gradual thing. Our land drains fast, so the water never stands despite the amount of rain. But that is why the cows are moved daily, and the building the fence thing – it is easier than most chores I do. It is temporary, only meant to keep the cows in place for a day, so it isn’t like the monumental task of building a permanent fence or even repairing permanent fence. Basically it is pounding posts with a hammer, string the wire, call the cows and that’s it. Della is a peach, her mom was a real sweetie, but she has a mind of her own too. So interesting, as usual. You write well and the pictures are very illustrative. Since you are considering going “no hay”, I assume you don’t get snow? What about heavy rains and mud issues? Or is this not a problem if you move the cows often enough? And you thought you might be running out of things to write about! I am running out of things to write about! My life is pretty boring! I am only considering the no hay, I don’t see us ever going completely hay free, but less would be OK. If the stockpiled grass is tall enough, the cattle will dig through the snow to get it. We do get snow, but not as much as you think – last winter was a doozie though. We just don’t have the mud issues with the high rainfall because we have a very healthy sod, and the cows are not left in one area too long, and our flat land is on the ridge tops not in valleys. Tall grass develops deep roots, the soil drains better, but like most things this is a work in progress. I would like to find someone who has actually done the High Density Grazing with our amount of rainfall – not the 35″ most call high rainfall. My biggest worry is the nurtrition factor of the hay after months of moisture. Stockpiling works especially well in brittle environments – non-brittle is a little harder. I also find your topics fascinating, and well written. I also appreciate when you go into the finer details, I really don’t think you’re done writing about fencing, cuz I still have a lot of gaps in my mind about what you do and how you do it. It seems simple to you, but my sheep are 15 minutes away depending on traffic and I’d really like to minimize the mistakes. Most things I have read say that electric fencing should not be the perimeter fencing, although Powerflex says otherwise, am using PVC pipe for the posts (really cheap) but need some time to observe the sheep behind the fencing so I know they are secure. But as I get experience and develop some confidence in my skills I feel like the sky is the limit. I’m gonna be a farmer with my own land yet, I can just see it. I’m totally with you on wanting to not feed hay through the winter, but am not willing to sacrifice the animals due to me not understanding something, or my fields not being built up enough yet. Just want you to know how much I enjoy and appreciate both your musings and pictures. I just love reading about your pasture and cattle management. The details and pictures are great. For an Agricultural Scientist who grew up in the city, your sensible and clearly explained farming techniques are extremely helpful. Thank you. Linda, somewhere, long ago, I read that it’s natural for livestock to lose some weight (condition?) through the winter. But it’s a modern idea for them to gain weight and they have been selectively bred for such things. However, the old style actually do better in the spring when the new grass flushes out and it’s a whole lot less money and effort for the farmer. Sometimes the newfangled ways do not actually work so well in the long run when one looks at the whole picture. Well anyway it made a lot of sense to me. Doris, I think what Linda meant was that you want the cows to maintain condition through the winter. 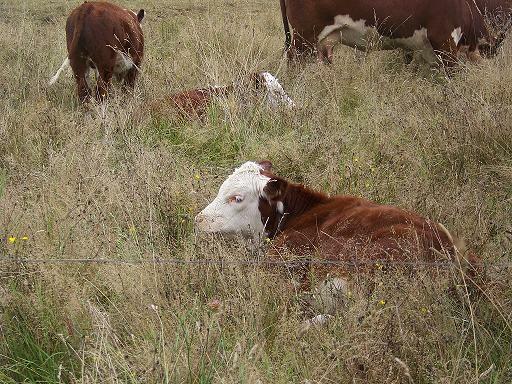 Although their calves will be weaned, they will be pregnant. Linda raises Herefords so she isn’t trying to keep weight on the huge continental breeds that are so popular for the feedlot industry. I read an article once at AcresUSA.com where the guy cleared half his land, ran out of money, threw the cows on there anyway, and was shocked to find the cows abhorred his cleared land and disappeared into his uncleared forest. I know my cow is very happy to munch on the saplings that are growing in her pasture, she pushes them over so she can reach to tops. I had previously thought cows were grazers, and goats were browsers, but she’s shown me that ain’t necessarily so. I think the beauty of the forest is that there is more variety in forage than most pastures. MOH, I read a lot, but but am just beginning to develop some practical experience, so I appreciate those finer details you point out. =) Of course, many times what I read and what I remember can have some variables, lol. Try to find the movie “A farm for the future”. Sure , it’s produced in England. But it is about a woman trying to find a way to have a sustainiable future without having to rely on industrial fertilisation. But still, giving the cows enough grass to cope and thrive but still not taking to much of the lands nutrition without having to give it industrial fertilisation is surely a task worth taking! Caena, thanks I will look for it – it sounds interesting. Thank you again. Nita, even though I do not raise cows, I really enjoy reading about yours. Your cows look so healthy and Della is wonderful. It is just interesting to read it. I can’t imagine all the hard work you must do, but I know it is worth it. finding pam, thanks – all that hard is work is fun so I don’t mind! Up until I found you, I was tempted to have a cow or 2 of my own– I had seen plenty of other people with cows on 5 acres or less and thought they did just fine. Then you come along and start talking about how a cow should look, what a cow should eat, what the pastures should look like, etc etc.. and I have had my eyes opened and realize that I DO NOT have enough land to support even 1 cow. I love the way you write, both from a personal standpoint and a learning standpoint. You are willing to put out there your trial and errors and not afraid to make statements either. Thank you for your candidness and for sharing. No, no, no, not at all! I still want a cow someday, but not until we have more land to support it in a healthy way for both the cow and us. With 15 acres, 75% of it wooded, it doesn’t leave much for a cow, and that would be very selfish of me to force a cow to survive on less than 3 or 4 acres, of which she has to share with the garden and the house and the mini-orchard. For now, I’ve switched my focus to getting milk goats. Now THAT, we can properly support and keep it healthy with the land we do have. Keep it comin Sista! I’m starting to get it, little by little. Have you heard of Brix. That’s a new one for me too and I’m trying to learn and figure it all out. When I have a little more time, I’ll send you some info on it. It talks about the “fatness” in the grass. It’s all Greek to me right now. I love Della! She is so beautiful. You can never post too many pics of her. Oh yeah Brix and I are well acquainted – if your land is properly managed the Brix content will be high. Low Brix is more common on conventionally grown crops, so no worries here. OMIGOSH somebody else who knows about Brix! I knew you had to know about it. I’m still trying to get my mind around it…not an easy task! I understand just enough of the basics to let my pasture grow at least 6-8″ and then mow since my girls can’t keep up with it….then next yr hopefully I’ll be able to manage strip grazing. I’ve got so far to go. Baby steps! I love reading your posts. They are very informative. What do you think about small breed cattle? Eliza, thanks! I prefer the regular size cattle, just because of the ease of finding breeding stock, etc. I helped a friend get started with a milk cow and she had her heart set on a mini. She did get her cow, and she is doing OK, but she either has to find a small bull that is not related or depend on AI and that can be a pain and is very expensive. Might be similar to having a Rolls Royce compared to a Ford, the novelty is great but the reality is a whole lot different when you need parts! And a mini can be just as dangerous as a full size cow, they are still good sized. Are you thinking of selling meat or milk, or just having small animals because of space limitations? I was interested, because I don’t know what I would do with the large amount of milk a full size produces and space limitations. I am still learning how having a family cow works. It is a dream for the future. Thank you for sharing you knowledge. So many skills have been lost. Uhhhh, MOH, that there Della looks about as “good going into winter” as I have EVER seen on a dairy cow. Good thing you are the “butter lady” huh? Risa, if they don’t look like that heading into winter – they look pretty bad coming out the other side! She’s old too, so I have to take good care of her. I would rather say she lived a long life than being proud of how many gallons she gave. Now that’s a good answer … my straw hat’s off to ya — you’re good at what you do and tell it about as well! I apologize for jumping into this conversation late. I’ve been lurking around, and I’ve missed a few days, but I do have a couple of questions for you, if you don’t mind. First, how large are your paddocks, in general? I know there are a lot of variables there, but just give me a ballpark figure. How many head are you running (again, on average)? How long does it take to get until the cattle are repeating on a piece of ground? (In other words, since sometimes I can’t make myself clear, let’s call where they are today Paddock 1, and tomorrow they will be in Paddock 2, etc. How long will it be until they are back to Paddock 1? Randall, no problem, but like you say there is lots of variables. Figure 80,000 – 100,000 pounds per acre, per day. That will tell you how big to make your paddock. However, I would use math only as a way to give yourself an idea of how small or large to make your paddock. 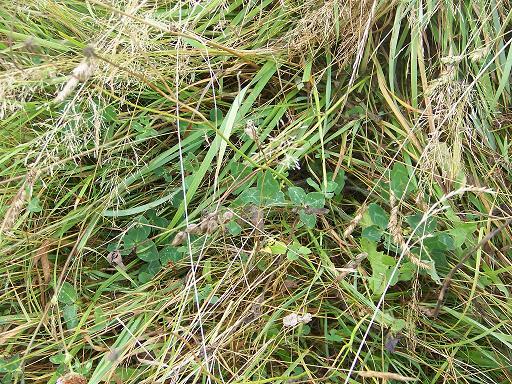 Variables are quality of grass and forbs, time of year, and where your cattle are in their cycle – short bred, open etc. My rest time (#1 back to #1) is about 118 days at this point. Usually when people begin grazing they take their acreage number and divide it into a certain number of paddocks, while this is better than continuous grazing, it still doesn’t take much into account except # of acres and cows. Hope that helps. We have since brought home another cow and are finding our Momma cow grazing much much better. She is putting on more weight and seems to be grazing much more with less down time. She’s really enamored of her friend—even eagerly moving to the farthest pasture without fuss now. The pasture she seemed to hate (very secluded). Everything else being equal (which it is) it seems she was just lonely. We are very pleased since we were wracking our brains about how we were feeding and what to do about her not picking up any weight. Just goes to show that even though humans say you can own a lone milk cow — they don’t much like it. Guess momma felt her baby just wasn’t entertaining enough and needed some adult interaction ;-D Mothers day out anyone? P.S..Thanks for all your help recently. Thank you for covering this topic so beautifully, and thank you thank you THANK YOU for the pictures!